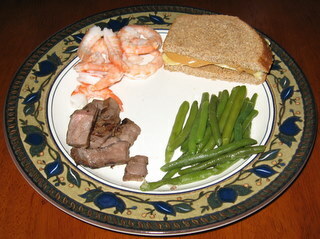 This is Boy’s idea of the perfect (made from leftovers) meal: protein (steak), protein (peanut butter and banana) and more protein (shrimp). I made him eat the green beans with it. This is my idea of Summer Perfection. Great fresh bread, crispy bacon, juicy, farm-ripe tomatoes, crunchy, sweet lettuce and creamy, tangy mayonnaise. Simple, yet SO good. 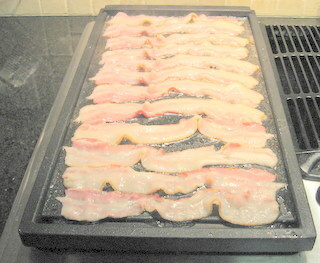 I LOVE this griddle attachment to my cooktop. I can cook a pound of bacon in a jiffy. Also great for making scads of pancakes. We bought a cookie bouquet from this company for our new neighbors that just moved in across the street. 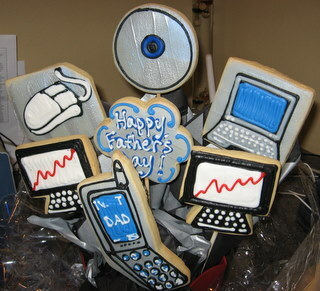 While the kids and I were there to pick it up, we saw the cute “gadget-themed” Father’s Day basket above. We couldn’t pass it up for the sweet-toothed techno-gadget hound paternal unit that lives at our house. Although he loved it, the kids ended up (of course) eating most of the cookies. Hubby didn’t recognize the CD at first and wondered if it was an “all-seeing eye” – it is a little odd-looking. I normally like to make my own cookies, but, I have to admit, these are pretty yummy (almond extract?) and they do a great job of decorating them. It would have taken me HOURS and HOURS to create something even half as cute as what they are able to turn out. The 20 year Reunion for my high school was this weekend. I was really nervous about going (I had skipped the 10th and don’t really keep up with anyone), but summoned up my courage and took the plunge (thanks, Staci!) and I’m SO very glad that I did. I had a blast and plan to get together with some buddies soon. 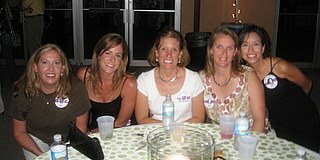 Overall, the ladies looked great, but a lot of the guys looked really different (some better, some not). A surprising number of us still live in Austin, or have returned to Austin after living elsewhere for a while (including us). Also noteworthy was how many of my classmates have turned out to be quite successful. I was proud – we seem to be a pretty well-adjusted group of upstanding citizens – lots of REALLY cute kids, too. Maybe just the “success stories” feel motivated to come to the reunion, who knows, but it did seem that most of us have done well for ourselves – that was nice to see. 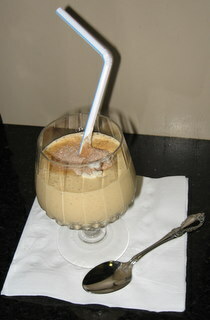 This recipe (a HUGE favorite in our family) comes from my friend, Anita, in Northern Virginia. She also adapts this recipe to make Zucchini Bread, but I’m currently sans garden and subsequently, sans good, fresh zucchini, so we just stick with bananas. Stir butter, sugar, eggs and water together until well blended (I use a KitchenAid mixer). Stir in bananas. Mix in flour, soda, baking powder and spices. 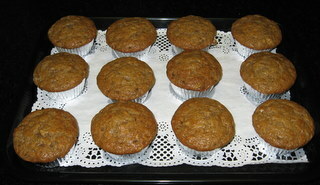 Pour into 12 muffin cups (lightly greased with Pam or lined with paper or foil muffin cups) or one regular-sized loaf pan. Top with nuts and cinnamon-sugar (if desired) and press topping lightly into batter. Bake at 325 degrees for about 20 minutes (or 40 minutes or so for a loaf pan) or until a toothpick comes out clean and tops are golden brown. If you have decided that your idea of a good dessert is one that will make you gain 10 pounds and lose 10 teeth, this is definitely the recipe for you…. All I can say is that this sounded like a good idea, in theory, but God Almighty, this thing is rich.